This mix (especially the part with Bono) is too good. Any chance of these things being put on bittorrent? I never ever had any problems with downloading stuff from this forum. But using the IE 6 didn't work with this particular mix. But Firefox did well, w/o any problems. Maybe this information is useful for further fans who have trouble downloading this mix. Maybe sometime in the near future, will keep you guys posted when that happens. turned it up and had to turn the volume all the way up... what a start for a mix "Push - Strange World" wow. that track brings back me back to the good times. dj GT come to denmark!!! I've been trying to get this mix for a bit .. neither Explorer nor Netscape will give me an option to download them, and I can't see a link on the pages. Can anybody help me out? yo guys wheres the cue sheet? This one is still active! Waiting to download..
AMAZING, djGT I LOVE YOU! Unforgettable mix, I love them all! Forever, you are the best of the best! Awesome mix! 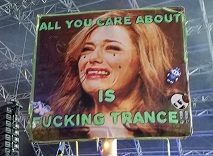 God I miss the old days when trance was trance!! !